The idea of outstanding capital is quite simple: it is the amount of capital due by the borrowers, interests and provisions excluded. Nonetheless, it is important to correctly understand how outstanding capital is calculated, as it is not as simple as it looks and sometimes this might generate some confusion. Where and how outstanding capital is displayed? Outstanding capital can be found in two areas of the portfolio page: Summary and Loans. You can also get a more detailed view of the outstanding capital of each project in the Loans page. 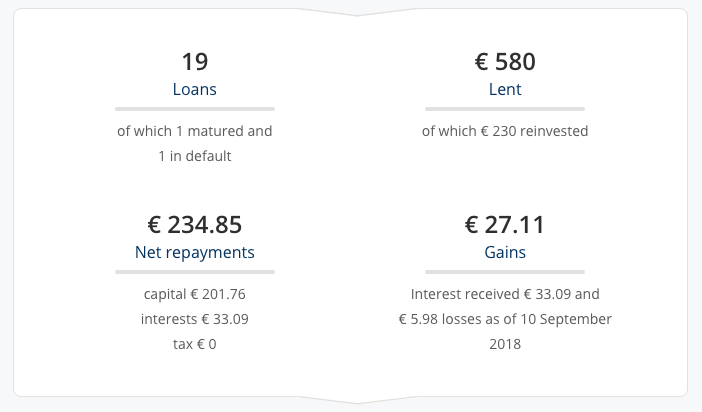 The first example below shows the outstanding capital of a project up to date in its repayments whereas the second example shows the outstanding capital of a project with a default of less than 30 days (see next paragraph for explanation about how defaults affect the outstanding capital). Project defaults have an impact on the outstanding capital. In case of default we apply a provision to your outstanding capital, which increases according to the number of days of delay. Indeed, the more days the borrower is in default the less likely it is going to repay. Why do we apply a provision on your outstanding capital? It is the best way we have found for you to visualise the health of your October portfolio at any given time. Loans which are subject to a legal recovery procedure or more than 120 days late (black projects) : 100% cut. Therefore, the outstanding capital is progressively cut as the provision applied increases. It is important to note that provisions and early repayments, affecting the outstanding balance, also affect your internal rate of return (IRR). You may notice that this provision may result in a loss of gains in your Portfolio page. This is due to the fact that we consider the cut of outstanding capital as a potential loss, which will obviously have a negative impact on your gains. Nonetheless, you should keep in mind that this is only a provision, even in case of default it might still be possible to recover* the amount due by the company, partially or even totally. Also, in case all the other projects are not subject to defaults, you will continue to increase your gains, which will progressively reduce the loss. This implies that you have diversified your Portfolio. *For more detailed information on how defaults are managed and displayed in your Portfolio page, you can read this tutorial. Although outstanding capital seems quite simple to understand as a notion, the way it is calculated might be a little tricky and generates confusion in many cases. Let’s see why. When verifying the exactitude of the outstanding capital of each project, you may be tempted to subtract the amount already received from the total capital you lent to the project. This always results in a wrong amount because repayments are made up not only of principal but also of interest. As mentioned at the beginning of the article, the outstanding just shows the principal to be received excluding the interest and the provisions. 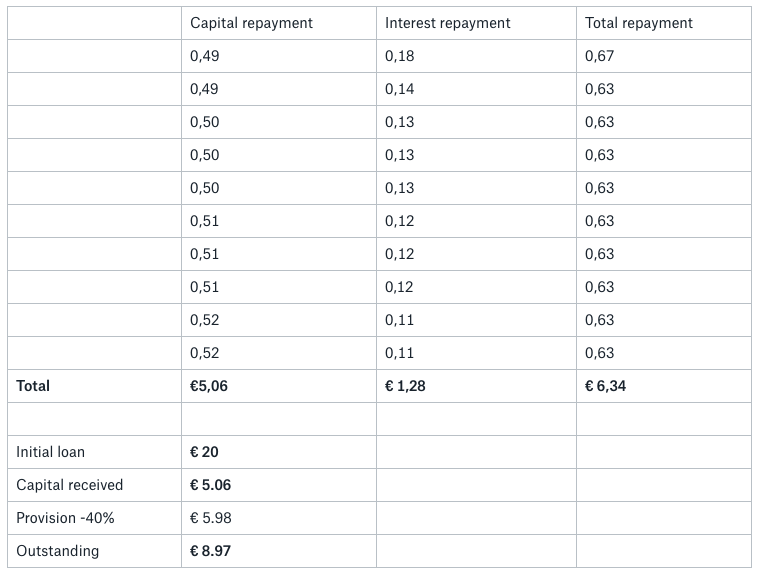 In order to calculate the correct outstanding amount you need to separate interests from the total amount received, and then subtract the total capital repayment from the initial loan. You can also consult your outstanding capital on one project directly from the initial loan contract. To know how to download your loan contract, you can read this tutorial. In case you have doubts or need any clarifications on how to calculate the outstanding capital of your portfolio, don’t hesitate to contact us at [email protected].